Stan's Donuts will open at 1301 W. Lake St. on Friday. WEST LOOP — Stan's Donuts is opening a previously unannounced storefront in the West Loop, bringing its signature pocket doughnuts to a corridor bursting with pastry options. The city's seventh Stan's Donuts has quietly opened in the West Loop at 1301 W. Lake St., next to the company's bakery. To celebrate its grand opening Friday, the West Loop Stan's will give away glazed doughnuts to its first 100 customers. 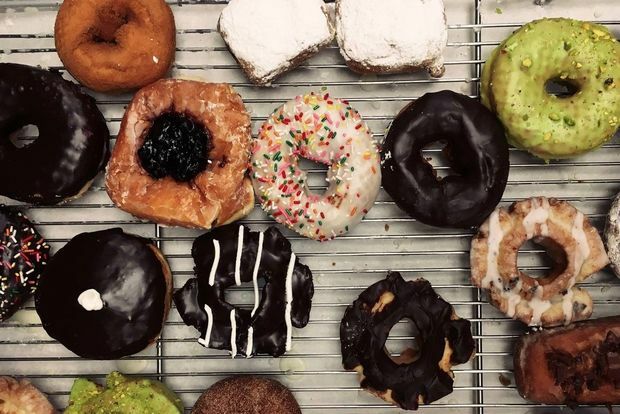 But the newest Stan's will have plenty of competition in the doughnut shop-laden West Loop: it will be located several blocks away from Do-Rite Donuts, Glazed and Infused, Bombobar and Warm Belly Bakery. Chicago's first Stan's Donuts opened in 2014 at 1560 N. Damen Ave. in Wicker Park, branching off from the Los Angeles-based Stan's that started in 1963. Since then, Chicago outpost owner Rich Labriola has opened Stan's Donuts in Streeterville, Lakeview and the Loop, with plans for at least another two in the next few years. There is also a suburban Stan's in Oak Brook. Stan's Donuts offers up to 35 varieties of old-fashioneds, fritters and twists. Its signature pockets also come packed with flavors like peanut butter, Nutella and Biscoff cookie butter.